Every year, millions of people set New Year’s resolutions for the upcoming year. The majority of folks will set goals of eating better, losing weight, or building better relationships. According to the Statistic Brain Research Institute, as reported by Philadelphia CBS local, only 64% of people keep their resolutions past the first month, and after six months, only 46% keep their resolutions. But what about educators? I have set goals for myself and my classroom before, but New Year’s resolutions always seemed like empty promises to myself. How do we create meaningful New Year’s resolutions in our classroom? What if we used traditional resolutions in our classrooms: eat better, lose weight, and build better relationships? I, for one, have never thought about setting professional resolutions so that I could better meet the needs of my students, but this year, I am returning from Winter Break with resolutions that will help me to be a better teacher. We all share the end goal of reaching every student, but the Global Elements of Effective Flipped Learning Table (GEEFL)™ that was recently released is an excellent tool for helping you set smaller goals that will help you to chip away at reaching every student in your classroom effectively. Pairing your classroom resolutions with the GEEFL will allow you to keep the resolution forever, instead of just for a month. It is essential to think about this question in the context of connections. 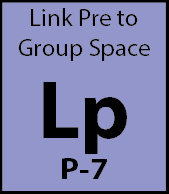 The GEEFL contains the element Lp, which is Link Pre to Group Space. What are your students digesting in the individual space, and how can you make it more meaningful or satisfying for the appetite in the group space? Bridging the gap between the individual space and the group space is a challenge, but it is a necessary ingredient for successful Flipped Learning. When we can make solid connections between the two spaces, students can create a healthy balance with the curriculum because they can see the connections between what was learned and why it is essential to understand. Melissa Kelly wrote an article titled 10 Ways to Make Education Relevant in which she formulates some excellent connections between what is learned and what students do with the content. She suggests that students need to engage with the content actively in meaningful ways — whether through simulations or project-based learning. This engagement moves students away from being empty vessels that need to be filled with knowledge and towards change agents that interact with the knowledge. Our students need to see the content that is presented as meaningful and real. The group space is a place where students can interact with the material in ways that bring numbers, history, philosophy, and theory to life. How do we lose weight in our classrooms? This question has nothing to do with walking around your classroom more, but to be fair in Flipped Learning, it is hard to sit for too long. Losing weight in your classroom refers to trimming the fat in the content and getting your students to run the steps of Bloom’s taxonomy. 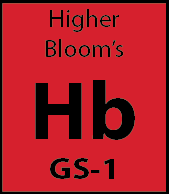 The element Hb is Higher Bloom’s. Traditional pedagogies barely provide enough time to engage in the lower levels of Bloom’s. The problem in traditional instruction is that students are educationally out of shape. By only engaging in the lower levels of Bloom’s, it is as though our students have been sauntering through the content. The real educational fitness training of Bloom’s exists in the upper levels. We need to get our students to start training in the arena of analyzing, synthesizing, evaluating, and creating. Students begin taking ownership of the educational fitness program once they are given opportunities to exercise in the upper levels of Bloom’s. Flipped Learning moves the lower levels of Bloom’s to the individual space, and it gives the freedom and time to finally provide our students with the exercise they so desperately need in the classroom. Activities in the group space allow students to engage with the pre-class/individual space content in new and meaningful ways. Activities can range from games (see my version of Hungry Hungry Hippos here) to trivia via Kahoot. A specific instructional method that targets the upper levels of Bloom’s is Project-based Learning (PBL). In PBL, students use projects as their main course (not the dessert) for learning. Students are given choice which allows them to be creative. They actively analyze and evaluate information to see how it impacts their project. The Hb element pairs well with the Lp element. If we can build strong connections between the individual space and the group space, we will be able to engage the upper levels of Bloom’s in the group space and provide a well-balanced educational diet. 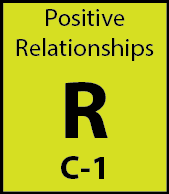 How do we create better relationships within our classrooms? New Year’s resolutions within our classrooms have the potential to help us to reach every student in more dynamic ways. Just setting some goals will set you apart and put you on a path to reaching more of your students. Now is the time to go to the GEEFL and look through the elements of Flipped Learning. As you look through them, I encourage you to determine the areas of your Flipped Learning practices that need some attention. Once you have identified the areas you would like to improve, set those as resolutions and write them somewhere in your classroom so that you will see them every day. Do not let them fade into the abyss of unkept New Year’s Resolutions. What resolutions will you make this year? I would love to hear your plan for reaching every student in 2019.